Well it’s officially cold here this morning with the thermometer reading a cool -26F this morning. Shooting when it’s this cold can be a pain sometimes, especially if you have a tendency to get cold fingers (which I do). However, as with any adverse weather, it can lead to some beautiful elements and experiences in nature. 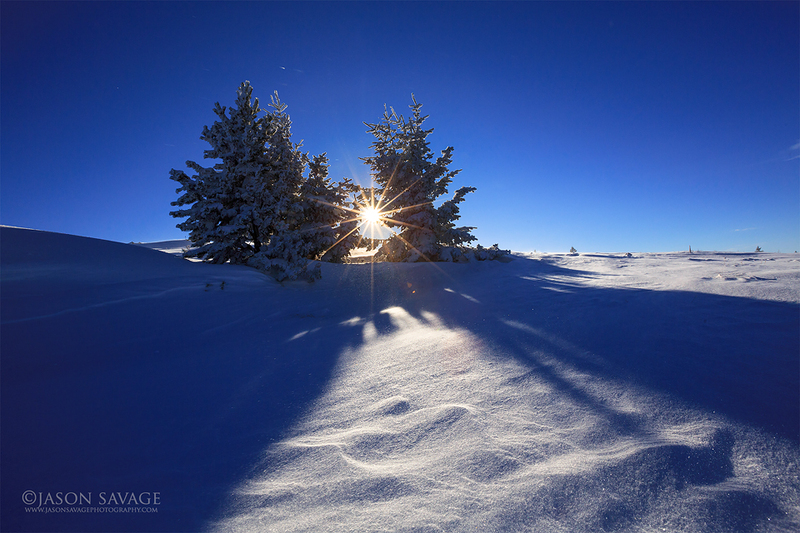 Here’s a shot from MacDonald Pass, along the Continental Divide located near Helena, Montana. Looking for elements to put together along the sloping mountain top, I especially liked the lone trees and the dramatic shadows they were producing across the frozen landscape. And adding the sun with an aperture of f16 gave a nice extra element as well. While out snowshoeing or skiing in the cold I usually keep my camera on a strap under my jacket so it not only keeps it from dangling around but I don’t have to continue fumbling with zippers when pulling in and out of a bag. I also wear a pair of medium weight wool blend gloves underneath my warm mittens that allow me to handle the camera, but still keep my fingers semi-warm. Fine tuning my workflow and gear in the cold seems to be an ongoing process, but each year it seems to get a little better and makes working in such cold conditions that much more enjoyable.